Curiosity – A Discover Channel television series. As an example of where our public understanding of developmentalism (universal development) is today, let me recommend a Discovery Channel video on evolution, Mankind Rising (2012), available for $1.99 at YouTube. This is Season 2, Episode 8 of the Discovery Channel series Curiosity, a five-year, multi-million dollar initiative to explore fundamental questions and mysteries of science, technology, and society, in sixty episodes. Mankind Rising considers the question “How did we get here?” It tells the journey of humanity from the cooling of life’s nursery, Earth, 4 billion years ago, the emergence of the first cell, perhaps 3.8 billion years ago, to Homo erectus, anatomically modern humans, 1.8 million years ago. It does this in one 43 minute time-lapsed computer animation, the first time life’s history has had such a treatment, as far as I know. The animation is primitive, but it keeps your interest in the story. And what an amazing story it is. 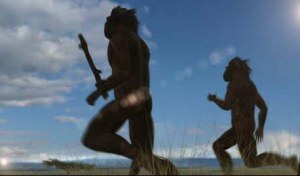 Homo habilis, the first tool users. Richard Wrangham in Catching Fire (2010) tells how an additional energy-delivering tool, fire taming and cooking, again used imitatively in groups, was another key human-developing event. Taming fire allowed us to move digestion of food outside our bodies into our environments, and with hunting gave us regular access to meat, a very high-quality energy and nutrition source. These two developments promoted social specialization for things like hunting, gathering, moving, shelter, and defense. From Homo habilis to H. sapiens, our brain size more than doubled, from 600 to 1500 cc, over a magic period of just 1.7 million years. We may have begun with pack hunting by ambush, which chimpanzees do today, and then graduated to persistence hunting, or running down our prey, sometimes in combination with setting fires to flush out our prey. We primates sweat across our entire bodies, not just through our mouths like other mammals. Humans have developed our sweating and cooling ability the best of all primates by far. As a result, two or three of us working together can actually run to heat exhaustion any animals that can’t sweat, if we hunt them in the mid-day sun. Some peoples persistence hunt even today, as seen in this amazing seven minute Life on Earth clip of San Bushmen running down a Kudu antelope in the Kalahari desert. Mankind Rising ends with Homo erectus (“human upright”), possibly the first language-using humans, 1.8 million years ago. Gestural and oral language was of course another clever way to grow our intelligence and simulation ability. We don’t yet have fossil evidence that Homo erectus’s larynx was anatomically modern, but there are indirect arguments. Language, both a socially imitative behavior and a fundamental tool for information encoding and processing, was very likely the final technology needed to push our species from the animal to the human level. In my view, the best definition of humanity is any social species that gains the ability to use technology to continually become something more than their biological selves, on any planet you care to mention, and regardless of the specific technologies first used. In other words, all humans are transhumanists, by definition, whether they recognize it consciously or not. Continually becoming something different and hopefully better, using technologies of all types, is what we do. We began a process of accelerating social complexification, rapidly distancing us from our biological origins, as social and technological learning occur so much faster than biological-genetic learning. We become a species with both progressively greater mind (rationality, intellect, curiosity, innovation) and greater heart (emotion, empathy, love, morality), the two core kinds of intelligence. We can use the developmentalist perspective to predict that the first collaborative fire-tamers and club and rock-users on any Earth-like planet in the universe must soon thereafter become its dominant species, as there are so many paths to further adaptiveness from the powerful developmental duo of creative tool use and socially imitative behavior. In Developmentalism, certain Universal forms and functions are statistically fated to emerge, as in biological development. Unfortunately, there are serious shortcomings to Mankind Rising as an educational device. The show’s narrative, and the theory it represents, are the standard one-sided, dogmatically-presented story of life’s evolution (the modern synthesis), with no hint of life’s development (the extended synthesis, still being worked out today. This is a very 20th century perspective, and we hope to see it replaced by universal evolutionary development sometime in the next generation. As a result, it treats humanity’s history as one big series of unpredictable accidents. This is the perspective of universal evolutionism, also called “Universal Darwinism” ”, which considers random selection to be the only process in universal change, ignoring the possibility of universal development. In evolutionism, all the great emergence events are told as happening randomly and contingently. The show even makes the extreme claim that life itself emerged “against the laws of probability.” The emergence of humanlike animals is also presented as a stroke of blind luck, because the K-T meteorite wiped out our predators, the dinosaurs. All of this is true in part, only from one set of perspectives, that of the individual, organism, or individual event. In other words this story, and evolutionism in general, is a dangerously incomplete half-truth. When we look at the same events from the perspective of the universal system, the environment, or distributions of events over time, many particular forms and functions appear physically predetermined to emerge, just the opposite of the story evolutionists tell us. Evo devo offers a very different universe story. Recall our example of the river, and now consider two additional complex systems, two snowflakes, and two genetically identical biological twins. Each example will work well. Most of what happens to these systems up close, at the molecular scale, is randomly, contingently, unpredictably different. But look at these systems from across the room, taking a system or environmental perspective, and you see that they achieve many of the same developmental endpoints over time. All rivers flow from source to sink. 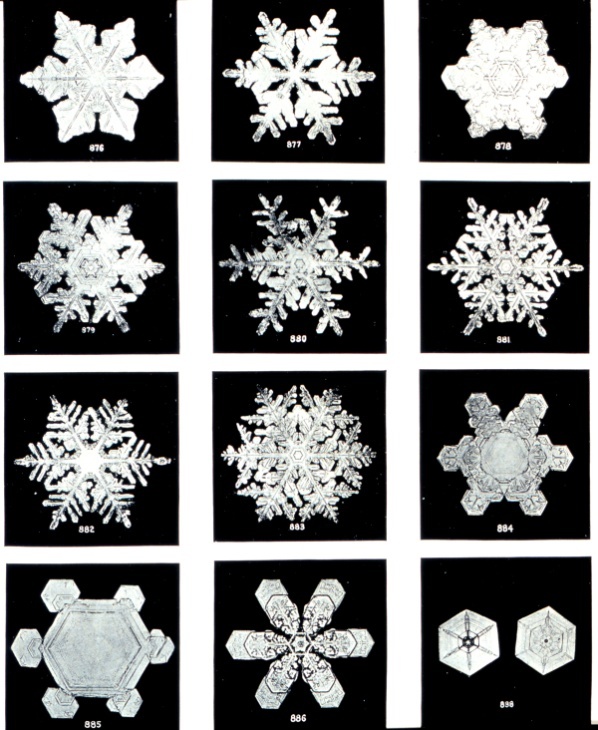 Every snowflake’s hexagonal structure is developmentally predetermined, constrained by the way water forms hydrogen bonds as it freezes. 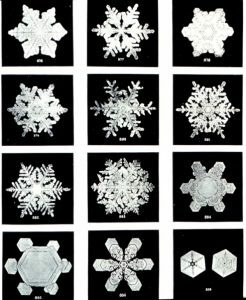 Perhaps most astoundingly, the two genetically identical twins will arrive at the same body and facial structure and many of the same personality traits years later, constrained by the organism’s developmental genes and their shared environment.The microstructure of each snowflake is unpredictably different as it emerges. Likewise, the microstructure of all the twin’s organs, including their brain, fingerprints, and many other molecular features are as different as the designs of two snowflakes. Up close, almost everything looks evolutionary (randomly and contingently symmetry breaking, exploring a tree of diversification). In universal development, just as in biological development, the convergence on standard and future-predictable forms and functions occurs because of the special initial conditions (physical laws, or “genes”) of our universe, the time constancy and environmental sameness (isotropy) of that physical law throughout the universe’s internal environment, and perhaps also due to invariant features of its external environment, a poorly-understood place physicists call the multiverse. For each complex system, both evolutionary uniqueness and developmental sameness can be seen, depending on your perspective. Let’s take a closer look now at how developmental convergence occurs, and see some examples of it, to understand what is still missing from our modern view of universal change.